Home / About CBD / What Is CBD? Cannabidiol—CBD—is a cannabis compound that has significant medical benefits, but does not contain THC, and cannot make people feel “high”. 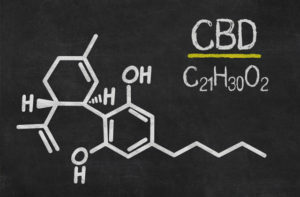 The fact that CBD is non-psychoactive makes it an attractive option for people looking for relief from many physical and psychological conditions. CBD can be obtained from marijuana or from industrial hemp, both offering the same potential medicinal & therapeutic benefits. Our bodies contain the endocannabinoid system. News to most of us! This system is made up of receptors. Think of a receptor as a gatekeeper to your cells. When cannabinoid receptors are stimulated, a variety of physiologic processes ensue. Researchers have identified two cannabinoid receptors: CB1, predominantly present in the nervous system, connective tissues, gonads, glands, and organs; and CB2, predominantly found in the immune system and its associated structures. Cannabinoids only affect us because our bodies contain cell receptors that are made to bind to specific cannabinoid molecules. Kind of amazing, right? Endocannabinoids are the chemical messengers that tell your body to get certain processes moving and when to stop. They help maintain optimal balance in the body, also known as homeostasis. When the ECS is disrupted, any one of the above-mentioned body parts and functions can fall out of balance. Why Don’t More People Know About CBD? To quote Sanjay Gupta, a Neurosurgeon and Chief Medical Correspondent for CNN who has done an intensive investigation in his CNN 4-part series “Weed”, “We have been terribly and systematically misled for nearly 70 years in the United States, and I apologize for my own role in that.” Any form of cannabis, including Industrial Hemp, has been illegal for the past 70 years, and even though products made from Industrial Hemp are now legal in all 50 states, change is slow. It is our goal at Revive Hemp to intentionally and mindfully change the face of healthcare by sharing CBD with all mammals.